Catwalk Trail Canyon Looking back across one of the catwalks that cling to the side of the cliff face. New Mexico has quite a few famous places to visit, places that are historically significant, naturally beautiful or just very well known. 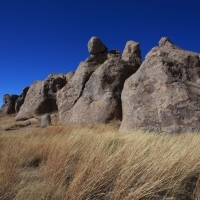 But where New Mexico really shows its qualities is in it’s endlessly remote places. So much of this state is off the beaten path so to speak and is incredibly beautiful. One such place for us is the Catwalk Trail. Before we got here we had never heard of it, but taped to the counter at the campground we were staying at, was an incredible photo of a narrow metal walk way bolted into a cliff face. We got the directions and headed out there the next morning. Beginning of the Catwalk Trail This is what you see at first. Not much indication of what is to come other than some pretty nature. 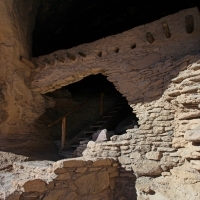 The Catwalks started out, like many things in the southwest, because of mining. 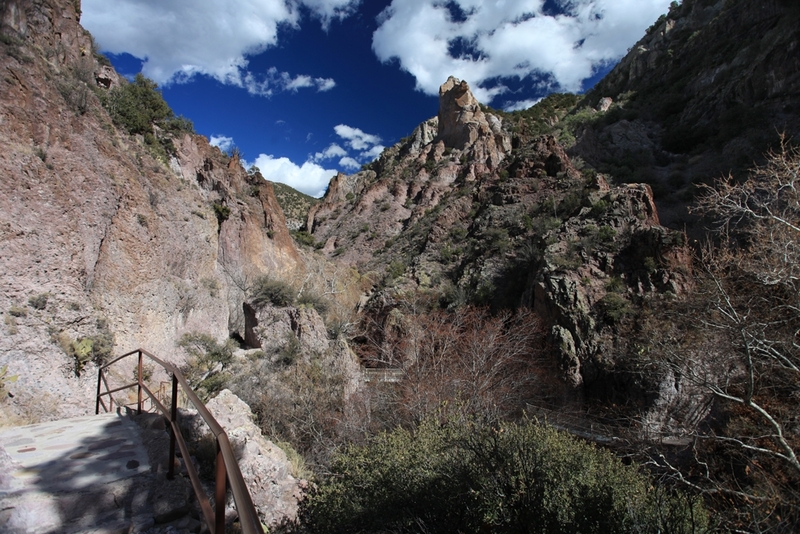 While the canyon had been known for many years - it had been a rugged hideout for both Butch Cassidy and Geronimo - It wasn’t until mining operations started up in the town of Graham in the 1890s that anyone really started to build anything there. The town and the mine needed water for it’s mill and the best way to get it there was to build a pipeline from further up the river. However the river was in a steep, narrow and windy canyon that flooded every year, so the best way to run the pipeline was to suspend it above the water so that it would be easier to maintain. The guys that had to go out and fix it started to refer to the precarious ascent up the canyon on the pipes as “The Catwalk” and so it stuck. Eventually the town moved on, but in the 1930s the Civilian Conservation Corps replaced the bits and pieces of old pipeline with a new catwalk for people to walk up the canyon. As it grew in popularity it was replaced with a metal catwalk in the 60s and then extended a little further upstream with a huge bridge that was brought in by helicopter. 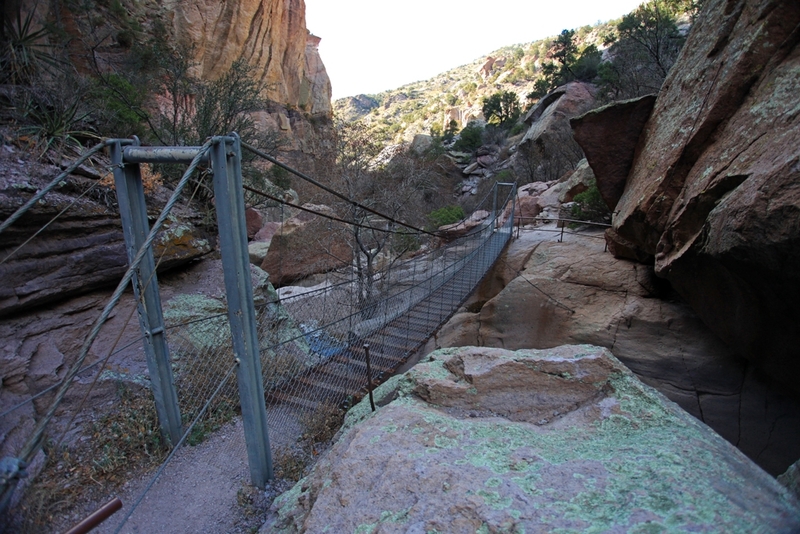 The Suspension Bridge This is the bridge towards the end of the trail that spans one of the canyons. It looks kinda rickety but i couldn't get it to break by jumping up and down on it. From the parking lot you walk past a picnic area where you can view the ruins of the old mill up on the hill side. from there a trail leads through the forest along the side of the stream. Pretty standard stuff so far, but you start to see the canyon walls closing in ahead of you. and where they seem to meet there is a metal walkway that darts into the slot in the wall that the stream comes out of. It really is a strange sensation walking over the water like that in a narrow canyon. The walkway is kind of like a gantry at a factory, a metal grid that you can see through. Its pretty incongruous to see in such a beautiful natural environment, but that’s what makes this place so great. Normally this canyon would be completely off limits because there wouldn't really be a way to get through the narrows to see upstream, but the catwalks basically let you levitate over the rushing water below. 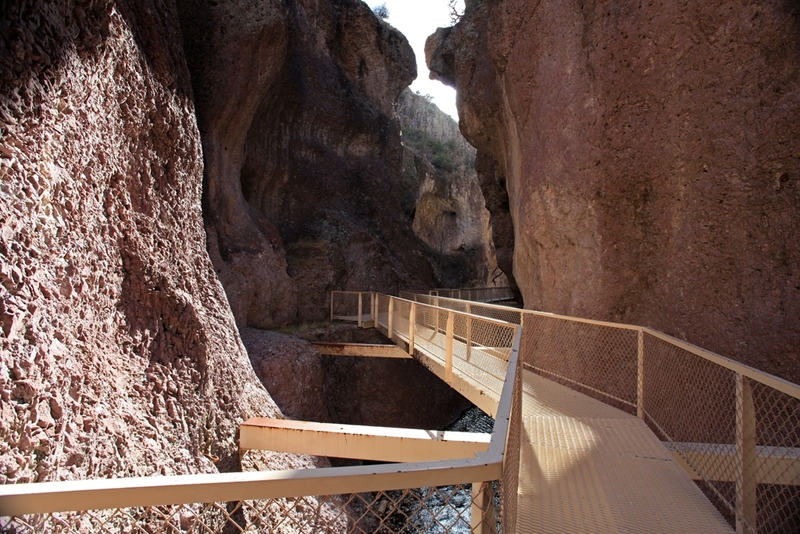 The metal walkways are just bolted into the cliff face so you are clinging to the side of the rocks, but after what is less than a 1000 feet the catwalk transitions into narrow trails on the cliff faces as you head up the canyon. In several places the trail traverses the stream with bridges, one being the one brought in by chopper and another up at the top a little over a mile in that is a little suspension bridge that leads to a cave that overlooks the waterfall at the top. The best part is that you get to turn around and see it all again from the other direction and the lighting in the canyon is constantly changing so it is like a completely different place. It really is worth it to go all the way to the end of only for the suspension bridge which is kind of like a metal version of the one at the end of “The Temple of Doom”. The Catwalks are right down the hill from Mogollon a great semi ghost town and not all that near anything else. But it is worth the hour and 15 minute drive from Silver City to make a day out of it.